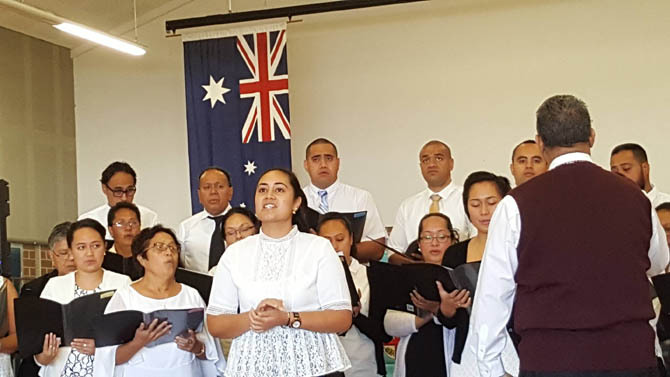 Here in Sydney, our Rotuma Day celebrations began with a combined church service on Sunday, 6 May before the cultural celebrations on Saturday, 12th. This gave people the opportunity to meet each other in worship and fellowship and thank God for our Island Rotuma and its people. Last year the Catholic community prepared the program. This year it was the Agape Fellowship group. Participants were from all different denominations and the Sydney community. The photo below is of Chantelle Konrote, from the Sydney Rotuman congregation singing a solo part. MERE Taito's eagerness and passion for writing has now earned her a place on New Zealand's 25 best poems for 2017. Ms Taito is originally from Rotuma and her poem, which is now on New Zealand's top list, is titled "The quickest way to trap a folktale". It articulates her frustrations towards those who are claiming Rotuman myths and legends as their own. "I was inspired to write after discovering in 2014 that the Rotuman myths and legends recorded by missionary/linguist C.Maxwell Churchward in the 1930s are held in copyright by Wiley International in the journal Oceania, to access these myths you will have to pay," Ms Taito said. She added, only Wiley Online library users could choose to rent it for 48 hours for $US6 ($FJ12), upload to the cloud for $US15 ($FJ30) or download and print in PDF form for $US38 ($FJ76). Ms Taito said she would not accept this as the indigenous writings were not theirs to keep. "I can't and will not accept the legitimacy of the copyrighting of traditional stories by large academic/publishing institutions,"she said "These stories, plot and characters are not their creations and therefore not their intellectual property to copyright. How dare they." Her attempts to get a response from the publishing institution have proved futile. "I wrote to Wiley International twice but was met with silence," she said. She however does not blame the missionary and linguist Churchward. "Churchward did a lot to write the Rotuman language. "In fairness to him, the 1930s was a different time of engagement with indigenous communities. Open source platforms were nonexistent," she said. "I think the problem is institutional-based rather than individual. "Churchward was a missionary who knew languages like a linguist." Ms Taito however hopes the poem will speak to researchers who also seek out indigenous communities. "I hope they make lasting friendships, I hope they explain clearly what 'access' means in terms of the knowledge they take, I hope they engage with respect and I hope they reciprocate fairly," she said. She is encouraging all writers to be true to themselves. "To all creative writers read, read creative writing too, good readers make good writers. Read to find your own voice but don't imitate," she said. Ms Taito was born and raised in Fiji before moving to New Zealand in 2007 where she now works for the University of Waikato in Hamilton and plans to pursue creative and literacy studies there. THE two-day Rotuma Day celebrations ended yesterday in Suva drawing more than 5000 Rotumans.Organised by Malha'a District, festivities featured a root crops showcase, and the display and sale of traditional food, handicraft items and dances. Malha'a District chairman for Suva, Jione Rigamoto, said the day was celebrated to remember Rotuman culture, heritage, dances and also to celebrate the occasion. 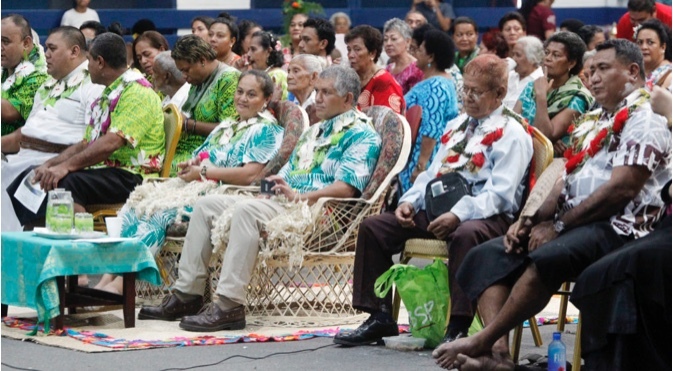 seven districts participating together here in Fiji," he said. "Farmers' day was celebrated which showcased our men's root crops and a women's handicrafts show too was held. "About 5000 members participated and witnessed the twoday celebrations. We also had some members coming in from Rotuma to attend the event and the rest were from the Western Division. Members of ourcommuinity from concentrated areas around the Suva to Nausori corridor were also present." Mr Rigamoto said a fundraising event for the seven districts raised more than $7000 over the two days. the event, said her crafts were made from natural sources and were environmentally friendly. materials I use are from recycled rubbish. I make bags, necklaces, earrings, fans and also weave mats from time to time. "This event also gives women the chance show our hard work and sacrifices and build a building block for our future generations. year is extremely positive. We can now see more people coming to know about handicrafts and how it is made." Rotuma Day is celebrated annually on May 13. 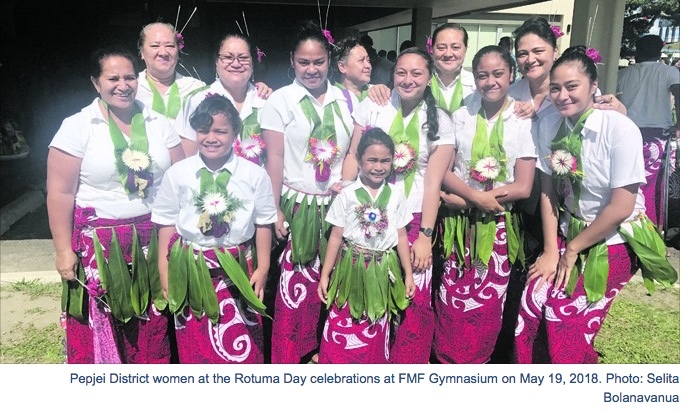 Hundreds of Rotumans in Suva gathered at the FMF National Gymnasium yesterday to celebrate Rotuma Day. Spokesperson Andrew Tomasi from the district of Malha'a said the two-day event which ended yesterday was not only to commemorate Rotuma being ceded to Great Britain but also bringing the Rotumans together. This is to revive their culture, sustain their language and also help their children to be aware of their heritage. This year's celebration was hosted by the district of Malha'a with the theme: Stand up Rotuma and See What Our Future is Like (Hagua Rotuma Tior'akia'ou ava). "Every year there is a different theme and this year, we came up with that theme because we feel that we rarely find pure Rotumans today because of the mixed marriages, and across cultures," Mr Tomasi said. "As a minority group, we want to help our people understand their roots and their heritage." He said even though Rotumans were now intermarried to other races, it was very important for them to hold on to their values and beliefs that their forefathers had passed on from generation to generation. There were also a number of chiefs, who had travelled, from Rotuma to attend the celebrations. He said when chiefs attend such an event it makes the event very unique. Some of the programmes of the two-day event included Women's Craft Show and the Agriculture Show where men displayed their root crops. Mr Tomasi acknowledged their sponsors BSP and Fiji Sports Council for their support. "I also thank the Fiji Rotumans Association and most of all I thank the Almighty God for the lovely weather," he said. The ceremony ended with entertainments and music last night. 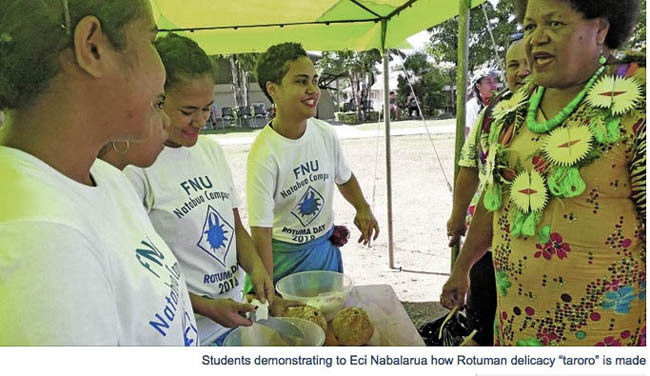 Members of the Rotuman community, friends and well-wishers gathered in numbers last weekend at the Fiji National University (FNU) Namaka Campus to celebrate the annual Rotuma Day. Chief guest and FNU's Pro-Vice Chancellor Learning and Teaching (PVC L&T) Eci Nabalarua thanked the Rotuman community for their contribution towards Fiji's economic and social development as well as its contribution to the education sector. Ms Nabalarua, who hails from the chiefly island of Bau, shared with guests her fondest memories growing up as a child and spending her time with members of the Rotuman community. "I'm overwhelmed to be invited to celebrate this important day with you all at the FNU Campus. I know that Bau and the people of Rotuma share deep links and I was always reminded of this while growing up by my parents and close family members. I have many Rotuman friends, some of whom are present here today. Let me tell you that you are one of us and we Bauans are proud to be associated with Rotuma," she said. The senior academic said although the Rotuman community was small; members were well connected, active socially and assisted communities in need. Ms Nabalarua said she had fond memories of her interactions with the Rotuman community and shared her appreciation of the generosity of the Rotuman community when they gave a handsome donation during a religious conference held in Bau some years ago. THE Parliament Bus program has been commended by the senior citizens on the island of Rotuma because it is the first time for most of them to learn different roles of the Standing Committees, the Members of Parliament and how laws are made. 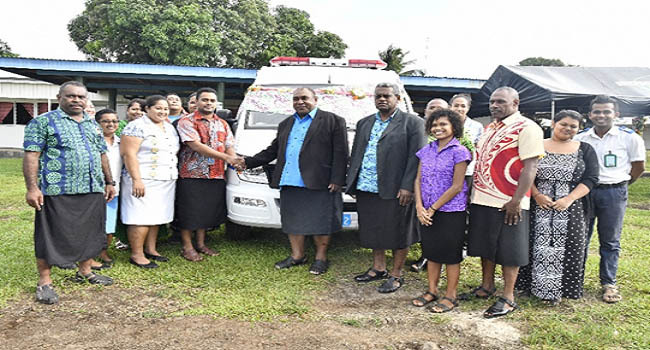 A statement issued by the Parliament Civic Education and Media Unit said the program had been made possible through the support of the United Nations Development Programme (UNDP) Pacific Office in Fiji, under its Fiji Parliament Support Project II, funded by the governments of Australia and New Zealand. 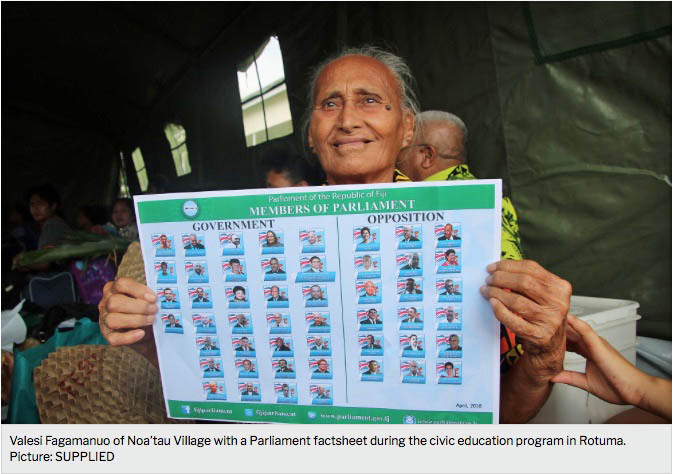 Valesi Fagamanuo, 76, of Noa'tau Village in Rotuma said the visit by the outreach team to the island last week was not only beneficial to the school students but also to the senior citizens because they still voted, like any other Fijian voter. "I am old and this is the first time for me to even know about the operations of Parliament. We never knew anything about Parliament. Before, all we did was vote and that's it, but now we know about the importance of Parliament," Ms Fagamanuo said. Another villager Luisa Semesi, 72, of Pepjei Village said the program was timely because Fisji was now preparing for the 2018 General Elections. Assistant Minister for Rural Maritime Development, Joeli Cawaki, says the government is committed to developing Rotuma Island. He made the comments as he opened the Rotuma Day celebrations in Ahau on Friday. Cawaki says the Government's investment of over $7 million for the new hospital in Rotuma, will certainly assist everyone on the island to have easy access to modern medical facilities. In addition to this, Government has also funded the upgrade of the Rotuma Airport which will assist in creating more opportunities for economic development. This $9.9 million investment will ensure improved access to and from the island with more capacity for trade and investment. Rotuman Language Week has made its official debut on the Pacific language week calendar as part of ongoing efforts to save the language considered endangered by the UN. 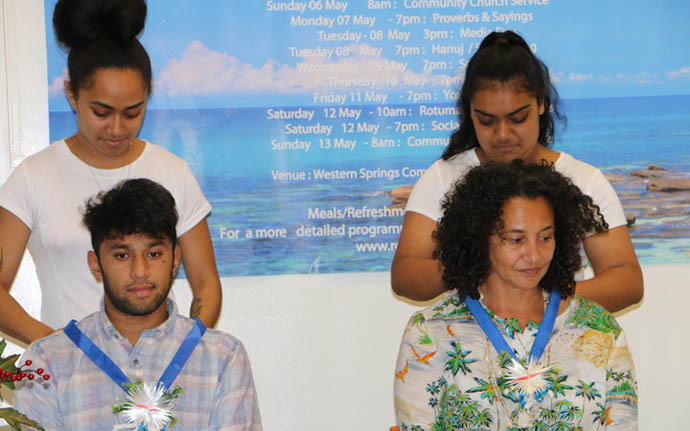 The Auckland Rotuma Fellowship Group made the decision to have their own week and planned a range of events that were promoted on social media. Ngaire Fuata recently made a documentary about her return home to Rotuma and she shared it as part of the week's celebrations. In the early 1990s she was famous for her song 'To Sir With Love' and now works as a television and documentary producer. She says that for years she'd covered many Pacific island language week events and so for Rotuma to now have its own week, separate from Fiji Language Week, is special. She wishes she had a Rotuma language week growing up. "I can't speak Rotuman and there are many Rotumans in New Zealand who can't but there are plenty who do and I think that as long as that remains they can help us non native speakers. We were brought up in an era where English was dominant, and you had to speak English well and there was no emphasis on being bilingual." Elder and pastor Ravai Mosese lived most of his life on Rotuma but now resides in New Zealand. He's seen a decline in language use among youth and says learning starts at home. Therefore he's urging parents and grandparents to consciously try to impart their language knowledge and culture to youth, calling it a God given gift. "There is no school in New Zealand to teach our children the Rotuman language and it depends on us the elders and the parents to do it at home." New Zealand All Black Sevens player Rocky Khan says having this language week celebrates an important part of his identity as a Rotuman and Fiji Indian. "They were talking about language week on the radio and I heard Samoa Fijian and Tongan language week being brought up and then that is quite common. But then after that I heard Rotuma language being brought up and I nearly crashed my car because being brought up in New Zealand and being Rotuman you never hear those things on radio. So I wanted to find out a bit more about the week and what is behind it and the purpose and so yes that is why I am here." Proverbs are popular among Rotumans and he learnt one about pushing down hard on a branch until it breaks, or to keep going until you achieve your goal. Mr Khan has never been to Rotuma, but hopes one day he will go. "With Youtube and social media, I get to see a lot of videos about the place and it looks awesome and real beautiful and something quite special about the place with no tourism and you can stay with friends and family. You can't go to a hotel there or anything, you can just stay on the beach or the bush." Ms Fuata wants to encourage more youth to visit Rotuma for themselves. She says sharing her own journey back to the island was important. According to her, the lengthy trip on the boat might be a deterrent for some, but once they are there it's well worth the effort to visit as the island is a gem. "I will have photos running behind me of the group and the things we did and I have got a little piece from my father from my documentary Salat se Rotuma where we brought messages from home all in Rotuma from home and there is a little proverb he shares too both in Rotuman and in English." Song, dance and cultural celebrations marking Rotuma Day, the anniversary of the island's cession to the United Kingdom back in 1881, brings the week to a close. Also see "A diaspora rallies to reawaken the language of Rotuma, pop. 2000"
and "Rotumans celebrate and reawaken their language"
The first ever Rotuman Language Week is being held in Auckland as part of ongoing efforts to save the endangered language. Rotuma is an island in Fiji with a population of around 2000, but the indigenous culture more closely resembles that of the Polynesian islands to the east like Tonga and Samoa. Organised by the Auckland Rotuman Fellowship Group, the aim is to inspire others to continue to share and use the language and pass it on to the next generation. 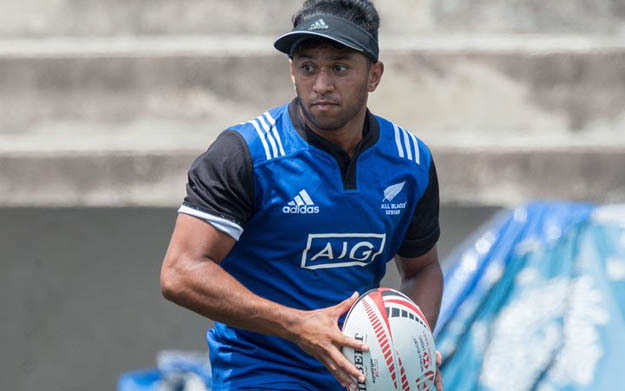 New Zealand All Black Sevens player Rocky Khan, whose mother is Rotuman and father is Indo-Fijian, said it's given him the opportunity to reconnect with his community and culture. "They were talking about language week on the radio and I heard Samoa, Fijian and Tongan language week being brought up and that is quite common," he said. "But then after that I heard Rotuma language being brought up and I almost crashed my car because being brought up in New Zealand and being Rotuman you never hear those things on radio," Mr Khan said. "So I wanted to find out more about the week and the purpose and so that is why I am here." The week's events culminate on May 13 to mark Rotuma Day, the anniversary of the island's cession to the United Kingdom back in 1881. Islanders who travel by boat to Rotuma say they have no other option but to use this mode of transport because it is the cheapest alternative. However, they are calling for Government intervention to ensure seaworthiness of vessels and safety at sea. Penelope Olsen is one such passenger. "Although I will be travelling with fear I have no other choice because this is the cheapest means of transport to get to Rotuma," she said as she left Port Mua-i-Walu yesterday on board the Victoria Marine-owned vessel MV Brianna with her two sons to celebrate Rotuma Day on the island. Ms Olsen, 50, of Ahau told the Fiji Sun about a trip she went on from Rotuma in February, describing it as horrific. "The vessel had engine failure," Ms Olsen said. "We were given life jackets. It took the staff four to five hours to repair the engine." Another traveller who wished to remain anonymous called on the Government to provide a speedy resolution. "You can never replace a life. "The long-term solution is a specially-built vessel for Rotuma. We are paying so much fare, but we are being provided poor services." Victoria Marine operations manager Felix Maharaj said: "The boat was passed by Maritime Safety Authority of Fiji (MSAF) and it has the necessary equipment and life jackets." Questions sent to MSAF remained unanswered when this edition went to press. For the first time ever, the "Parliament Bus" programme is reaching out to Rotuma to educate the islanders about the roles and functions of Parliament. The first target audiences of the outreach were the civil servants at Ahau Government Station who gathered in numbers over the weekend. Rotuma District Officer, Osea Ravukivuki, welcomed the programme on the island saying many civil servants have zero-knowledge about the operations of Parliament. Meanwhile, the team will visit 14 villages, four primary schools and a high school on the island as part of the programme. The Rotuman language is listed on the Unesco's list of endangered languages as "vulnerable". And now, members of the Rotuman community living in New Zealand have set out to do something to stop the demise of their native language. Hence, the Rotuman community of New Zealand is excited to announce their first-ever "language week" set to showcase the best of Rotuman culture. Rotuma is a Fijian dependency, consisting of Rotuma Island and nearby islets, with a population close to 2000. But outside of Rotuma, the population is believed to number more than 50,000. The island group is home to a large and unique indigenous ethnic group which constitutes a recognisable minority within the population of Fiji, known as "Rotumans". The week-long celebration of Rotuman culture, May 6-13, is being organised by the Auckland Rotuman Fellowship Group Inc (ARFGI). Activities will be held at the Western Springs Garden Community Hall. And in another first, they have also created a language chart to help those new to the language, and which will be of particular benefit for the younger generations. "We took the initiative using our own funds and resources, to move things forward and help save our unique language," chairman Faga Fasala said. The group hopes that this may also inspire other ethnic groups, including Rotumans, who live in other cities and countries throughout the world, to hold similar events. "Language is what makes us who we are, and is part of our culture and identity," Fasala said. "And it is our duty to preserve this invaluable taonga." The group hopes the week's activities will help bring people together and showcase Rotuman culture. "We invite all Kiwis to come and join us, and celebrate being Rotuman," Fasala said. "It has not been easy for our community to keep our language alive in Aoetearoa," Fasala said. "We pay tribute to our elders and leaders, who for the last 30 years, have continued to celebrate our culture in New Zealand, and for helping keep our customs and traditions relevant." 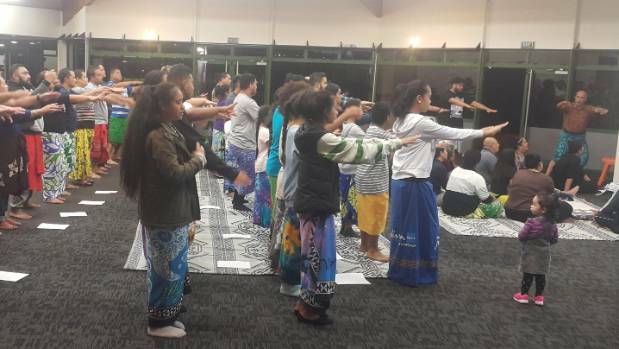 A separate media event is also being organised as part of the activities, in the hope that this will help introduce the unique Rotuman culture to the wider New Zealand public. "Each day of the week has been allocated to the different groups within our community," Fasala said. "With the elders, youth, sports, cultural, music, advocacy and religious leaders hosting their own days, Rotuman people are a separate ethnic group with their own distinct language, culture and identity, and originate from the polynesian Island of Rotuma." Rotuman is not the only Pacific island language list on Unesco's endangered list: Tokelauan language is "severely endangered", along with Nauru, while Niuean, Tuvaluan, and Norfolk are "definitely endangered". Rarotongan (Cook Islands) is also "vulnerable". Rotuma consists of the island of Rotuma and its nearby islets, and is located in the middle of the Pacific Ocean, about 500km north of Fiji, and 500km west of Wallis & Futuna. Rotuma was annexed by the British on May 13, 1881 (Rotuma Day). Vulnerable: Not spoken by children outside the home (600 languages). Definitely endangered: Children not speaking (646 languages). Severely endangered: Only spoken by oldest generations (527 languages). Critically endangered: Spoken by only a few members of the oldest generation, often semi-speakers (577 languages). Where: Western Springs Garden Community Hall, 965 Great North Rd, Western Springs. Members of the Rotuman community in Auckland practice "Taumaka" last week.